John, the author of the letters to the seven churches, was exiled here for his faith in the 1st century, and now, 2,000 years later, my father and I were arriving to complete our journey to this place where heaven was opened. After our boat docked, we walked through sleeping streets pulling our cases on wheels. The hotel reception was closed, but five keys were on the counter with names sellotaped to them… none of them ours. So we took two at random and bedded down for the night. I woke after an hour or two from a dream in which hundreds of people were walking up the street to our hotel, dragging their cases, the hundreds of rolling wheels filling the island with a great roaring noise, and all the people inexorably marching to claim the room they had booked and I had stolen. Awake in the dark, it felt like a updated scene from the Revelation, with the Beast and the Whore of Babylon checking in their luggage. This island has something spookily spiritual about it. Next morning, we walked down to the port town, Skala, which curls around a bay lapped by deep, transparent blue water. The sun was shining madly. The town is all restaurants patrolled by cats, craft shops stocked with sponges and shells, narrow streets revealing whitewashed, domed churches, Greek men hurtling by on motorbikes, Orthodox priests flapping or pausing to pinch the cheek of a child, shop windows full of icons, fruit sellers at the harbour, men busy doing nothing at a taxi rank. Over coffee at a streetside café we got talking to the owner and complimented him on the island. ‘It’s a beautiful place,’ I told him. High over the town on a hill is the Monastery of St John the Theologian. Late morning a taxi bore us up a winding road through pine trees, past a stonemason’s yard with signs outside advertising petra and marmara (stone and marble), until we reached the Cave of the Apocalypse, below the monastery. This is where the exiled St John received his Apocalypse, according to local tradition. And it is where our seven churches pilgrimage was completed. We stepped through the doorway and into the place where that word was alarmingly revealed. 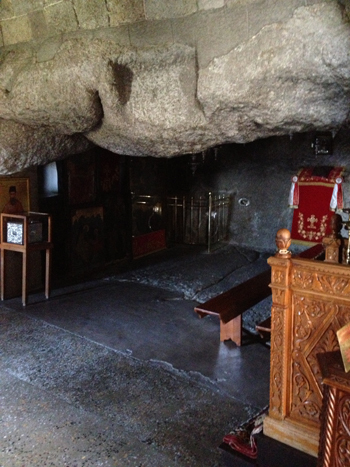 Although an Orthodox chapel has been added to the front of the cave, the powerful forms of the bare rock on your right are what immediately command your attention. The entrance to the cave is low, while the roof rises behind it, reminding me of a huge fireplace, which seems right. Holy fire touched down here. In a deep recess is a place of prayer, marked by red velvet draped over the rock and hanging silver oil lamps above. The cave reminds me of the prophet Elijah in the Old Testament, who stood in the mouth of another cave and experienced earthquake, wind and fire, but found God instead in a still small voice. St John’s writhing visions seem to be the reverse of Elijah. They have nothing of the still small voice, but all of the earthquake, wind and fire. And yet the atmosphere in the cave was quiet and expectant. We were there entirely on our own, which I think must be quite unusual. A small window shows the view from the mouth of the cave. Below are the trees, fields, hills and bays of Patmos, and then the sea, and then the eastern sky. As he sat here, St John looked out towards the faraway seven churches of Asia Minor. I sat with my father on a wooden bench and we prayed together. The cave has a beautiful acoustic. It is a place where the door of heaven opened for St John like the door of a furnace. In a small way, it opened for us too, but breathed only peace at the end of a journey.